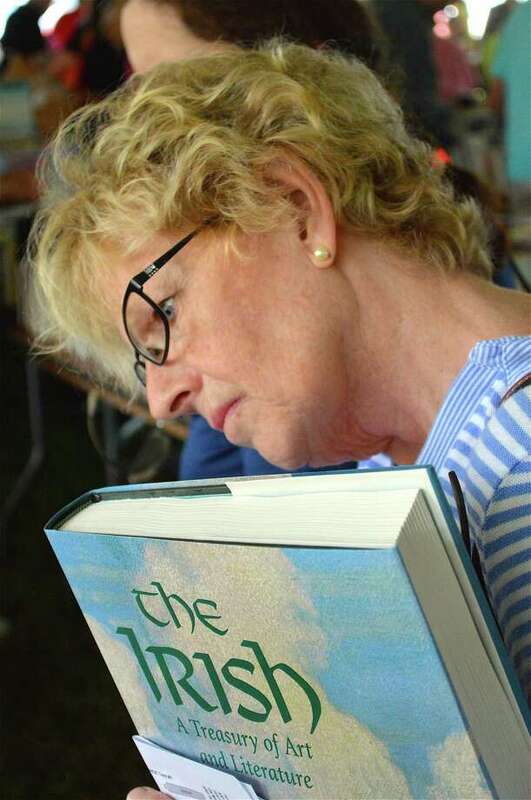 Agnes Paulsson of Westport takes a closer look at some selections at The Westport Library's 25th annual Summer Book Sale, Saturday, July 15, 2017, in Westport, Conn.
WESTPORT — Over 100,000 items and thousands of eager customers combined for The Westport Library’s 25th annual Summer Book Sale this weekend. “I actually like it because it’s a community event,” said Mimi Greenlee, who has co-chaired the event for a number of years. She was joined by close to 400 volunteers who helped set up the enormous sale this week and worked to oversee selection offered in more than 70 categories. Having begun Saturday, on Monday the sale continued with items at half-price, and on Tuesday items were offered for a contribution.